It seems that so many are with me on the fact that as parents, it's just too much of a palaver and hassle trying to get date nights out. So many people don't live near family to support and paying for babysitters can seriously rack up, when you factor in mum guilt on top of it all - to me it rarely seems worth it. I am much more of the 'date night in' situation. Which is why this valentines that's exactly what we'll be doing. So in this blog post I'm going to share with you some simple ideas to make a Valentines night in that bit more special, while avoiding major costs and a lot of messing around. This is an idea we're actually going to do with the kids for their tea, as we wanted to do something a little different with them and a meal out isn't exactly exciting for a 3 and 8 month old. We have this BEAUTIFUL, (it truly is amazing) picnic hamper that we are dying to use from Savisto Home, we're super impatient and can't wait till summer so it's making an appearance this weekend. Noah loves picnics, he asks for them daily so I know he'll be incredibly excited to see us having one indoors. For a twist, for Mummy and Daddy when the kids have gone to bed, you could easily set it up with a antipasti style tea - I'm thinking nice breads, dips, cold meats etc. Adding in some wine, cheese and a DVD you're away. This is another thing that we are going to be using, I think date night boxes are truly fantastic. I know some people think the prices are extortionate as certain boxes retail at £50 but personally I think an evening out if you total train/taxis, a meal, drinks and potentially a babysitter, you're easily looking at triple + that amount. I love a night in I prefer it to going out I really do, but staying in can be a bit boring and it's easy to get stuck into the same rut of sticking a movie on and calling it a 'date night'. Subscription boxes like the Get Date Night box mean you're going to be having fun, doing something different and just spending quality time together. Each box always has a different theme so whether it's a one off purchase or you do upgrade to a subscription - you'll always get something different. By getting the subscription too, you're never going to forget to make time for each other. Now if you are competitive then this probably isn't the best idea as it might end in a row. Try and go old school, ditch the phones, the television and bring out the board games, if you don't have any in them buy one in advance a fail safe is Monopoly as it usually goes on for hours. When we were in our student years me and John would stay up and play this, usually incorporating some form of drinking sanctions - that's what students do right? And we'd have so much fun, it's light hearted and with some snacks too, I don't think you can go wrong. Creating a nice cosy place is something a bit different than lounging on the sofa all evening. Sift out some fairy lights and make building your den into part of the fun. Add in some pillow and a duvet for extra comfort, you could watch a movie or a box set but it's that extra bit special because you're all snuggled up. You can even it up for the kids to explore the next day. The most important aspect though is make sure you black out all other technology, kiss goodbye to phones and tablets and pop them in another room out of sight so you are tempted. Me and John do blackout nights regularly and I think it's key to both your sanity and relationship - life existed before social media and sometimes you need to remember that. 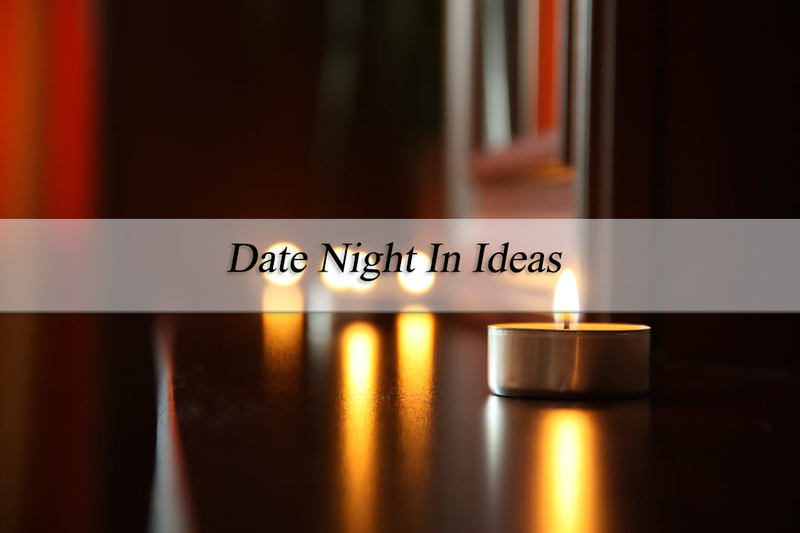 So they are my top four indoor date night ideas. With most people celebrating next weekend you've still got plenty of time to prepare. Do let me know if you have any ideas too. Great post! We find going out far too stressful because our kids never settle well for sitters and it is so expensive! What kind of stuff is in the date box? A date night box sounds like a good idea but I am all for the indoor picnic!